A one handed pepper or salt rock grinder. Great for people with one sided weakness or paralysis like those affected by stroke. 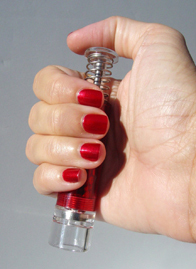 Hold grinder in one hand and use thumb to push button to grind and release your pepper or salt onto your meal. A electric device that can be attached to any cup to produce an audible alert when the cup is filled with fluid. Great for people with visual impairments that are uncertain when their cups are filled and/or spill by adding too much to their drink. 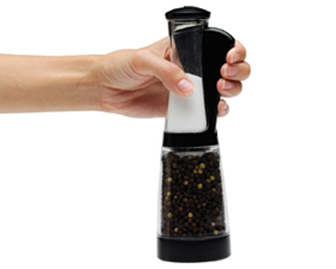 A one handed pepper grinder with a container for salt storage. Great for people with one sided weakness or paralysis like those affected by stroke. Hold grinder in one hand and use thumb to push button to grind and release your pepper onto your meal. 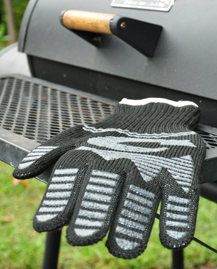 A pair of heavy duty heat resistant gloves that can be utilized for handling trays and other items on the BBQ or oven. 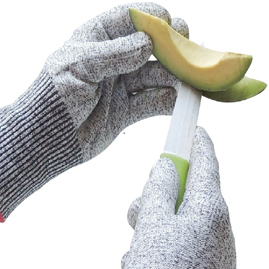 Great for protecting one’s hands from burns. A great gift for seniors and adults alike. 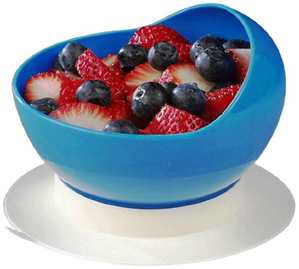 A bowl with a built up edge that allows a one handed user to load food onto their utensils and eat more easily. 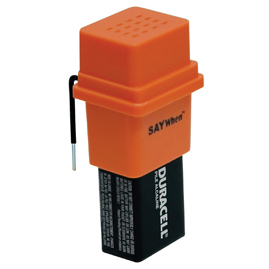 The base is rubber based and minimizes slipping while using it. Great for those with one sided weakness or paralysis.